seat contact is very narrow and located close to the bore. The grinding-in, using finer and finer compounds as the work progresses, causes the seat contact to become broader. The contact area should be a perfect ring covering approximately one third of the seating surface. Be careful that you do not overgrind a seat or disk. Overgrinding tends to produce a groove in the seating surface of the disk. It may also round off the straight, angular surface of the disk. Overgrinding must be corrected by machining. When a valve seat contains irregularities that are too large to be removed by grinding-in, you can remove them by lapping. A cast-iron tool (LAP) of exactly the same size and shape as the disk is used to rule the seat surface. 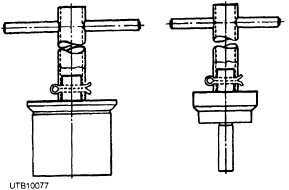 Two lapping tools are shown in figure 4-12. Here are the most important points to remember while using the lapping tool. 1. Do not bear heavily on the handle of the lap. 2. Do not bear sideways on the handle of the lap. 3. Change the relationship between the lap and the seat, so the lap gradually and slowly rotates around the entire seat circle. 4. Keep a check on the working surface of the lap. If a groove develops, have the lap refaced. 5. Always use clean compound for lapping. 6. Replace the compound often. 7. Spread the compound evenly and lightly. 8. Do not lap more than is necessary to produce a smooth, even seat. Figure 4-12. - Lapping tools. 9. Always use a fine grinding compound to finish the lapping job. 10. When you complete the lapping job, spot-in and grind-in the disk to the seat. Use only approved abrasive compounds to recondition seats and disks. Compounds for lapping and grinding disks and seats are supplied in various grades. Use a coarse grade compound when there is extensive corrosion or deep cuts and scratches on the disks and seats. Use a compound of medium grade to follow up the coarse grade. 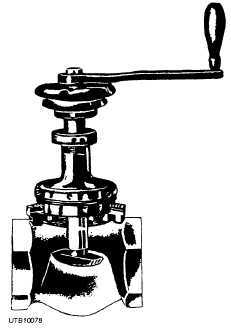 It may also be used to start the reconditioning process on valves that are not severely damaged. Use a fine grade compound when the reconditioning process nears completion. Use a microscopic fine grade for finish lapping and for all grinding-in. Badly scored valve seats must be refaced in a lathe with a power grinder or with a valve reseating machine. Use the lathe, rather than the reseating machine, to reface disks and hard-surfaced seats. Work that must be done on a lathe or with a power grinder should be turned over to machine shop personnel. This discussion applies only to refacing seats with a reseating machine. Figure 4-13. - Valve reseating machine.